How do I move a window whose title bar has been hidden? You can set mSupply to log an inactive client out after a customisable length of time. Set the length of time in general preferences. We are presuming that you will finalise and export your invoice data once a month. If you choose a different frequency, you should still follow the same procedure. Check your invoices are correct. Once you have finalised an invoice, it can not be edited. Finalize and export supplier invoices. See the file menu chapter. Finalize and export customer invoices. See the file menu chapter. Record the stock on hand value (this is only necessary if your accounting system requires the information). See the special menu chapter. Each month, take your finalised invoices and file them. We suggest you file invoices in order of their invoice number (a separate file for supplier and customer invoices). Keep a file with the summary printout from each month produced when you finalize invoices. It is usual to run according to a financial year. mSupply does not require you to delete records or perform special operations for the end of the financial year. If you want to, you can just carry on using mSupply as usual. However, there are certain procedures that will improve operation, and make an audit of your operation easier. 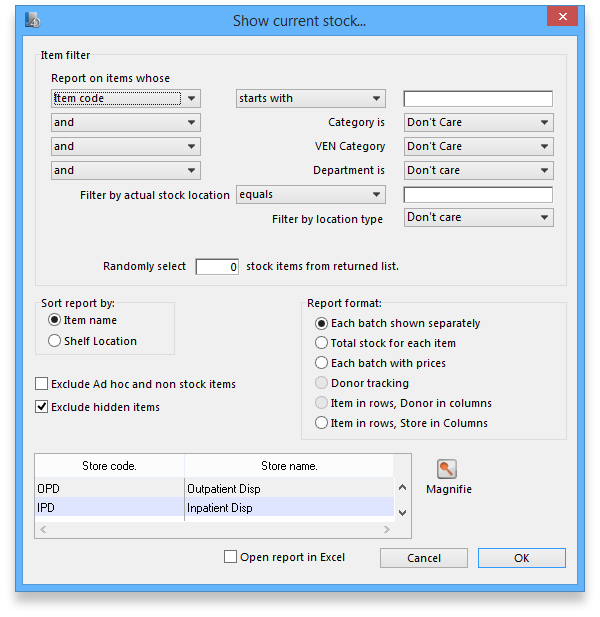 Print out stocktake sheets to record differences easily between actual stock and stock according to mSupply. See the stocktake sheets section of the “Report menu” chapter. Use inventory adjustment transactions to correct errors. See the Inventory adjustment- add stock and the Inventory adjustment- reduce stock sections of the “Item menu” chapter. Finalize inventory adjustments. Use the Finalize inventory adjustments command to do this. Make a backup copy of mSupply as it stands at year-end. It is a good idea to keep this backup in a secure place for long term storage. Print a ledger for each item. Choose “print item ledger” from the “report” menu. You can use your backup copy of mSupply to print this ledger at a later date. Choose “set start of year stock” from the “special” menu. This simply records the date and next transaction number, and records the total opening stock quantity for each item to allow a ledger calculation for the coming year. You are now ready to begin entering transactions for the next year. If you are using your data file regularly, it is a good idea occasionally to check that no problems have developed. Problems can develop due, for example, to faulty hardware and other reasons outside our control. In the case of a serious hardware failure, the first option should always be to revert to the last known good backup of your data. If for some reason you must repair a damaged data file, please contact Sustainable Solutions for advice. To check your data, download a product called 4D Tools . (4D Tools and a manual is included on the CD) from ftp://ftp.4d.com. 4D Tools can simply check your data file for errors, or repair your file. Please contact Sustainable Solutions if you believe your data file has a problem, before repairing it. Always use 4D Tools on a backup copy of your data first. If 4D Tools is unable to repair your data, Sustainable Solutions is able to use specialist tools to examine your data, and even export your data and re-import into a new data file. We have not had to do this for a customer yet, but the option is available as a near-last resort. Method 1: Press Ctrl and both mouse buttons, and drag the window to the new location. Method 2: Press Alt-Ctrl-right mouse button, while dragging the window to the new location. If you maintain the mSupply password system carefully, your data is fairly secure. Note, however, that if a person has access to the original copy of mSupply, they will easily be able to open the data file, as the “user 1” password is clearly shown in the password entry screen until it is overwritten the first time you click “OK”. It is your responsibility to keep copies of your mSupply software and data in a safe place. As of version 1.4, passwords stored in the data file are encrypted with strong (512 bit) RSA encryption, so there is little danger of someone finding your password. mSupply was initially designed to maintain data relating to a single store in each data file, and for many users, this is how mSupply continues to be used. Version 2 (and later) now meets the requirements of organisations/institutions operating with more than one store. Normally you will log into a particular store when starting mSupply, and only see stock and transactions relating to that store. However, users can be given the ability to login in as Supervisor - All stores. See About Stores. In this mode, users may now access data relating to more than one store - either selectively or cumulatively. In Supervisor - All stores you can also create Purchase Orders that will be based on data for all stores, and can specify delivery destinations for different lines within the order. In this mode, all of the report dialogue boxes relating to stock will display an additional panel. See the example of an organisation having four stores - General, Northern Medical, Southern Medical and Island Medical. Any user in 'Supervisor - All stores' mode will only see the stores they are allowed to log into in the list of stores to select from. The store(s) to be included in the report should be selected in the normal way by clicking with the mouse; to select more than one store, hold down Ctrl (Windows) or Cmd (Mac) while clicking on the desired store(s). The item search filters will be applied to items visible in the stores selected only. If there are a lot of stores in the datafile you can click on the Bigger List button to select the required store(s) in a separate window.